The possibilities are endless for children on Oxtongue Lake. Exploring the great outdoors can range from feeding chipmunks on the deck of the cottage to hiking the trails around the lake or in Algonquin Park. Rainy day visits to The Algonquin Park Art Centre can keep you busy with scheduled lessons or a more casual drop into the Centre to paint a birdhouse, paddle or nature mobile. Each week Algonquin Park puts out a flyer on various activities and special programs around the Park, many of which appeal to children so be sure to grab a copy to see what would interest your family. There is nothing quite like reading a good book at the cottage and the Dwight Library has many weekly activities for children. If action is what your children need, you will find biking, swimming, waterskiing, tubing, paddle boarding, learning to drive motor boats and fishing. Oxtongue Lake has a long history of annual events that the children anticipate each and every season. Canada Day fireworks kick off the summer season along with Canada Day activities at the Community Centre. There are also regular Movie nights, the Regatta, the Olympics. At the end of the day, nothing beats the time to reconnect with your family on a daily basis through trips to get ice cream and slushies at Lobos, boardgames, card games and happy hour at the beach. 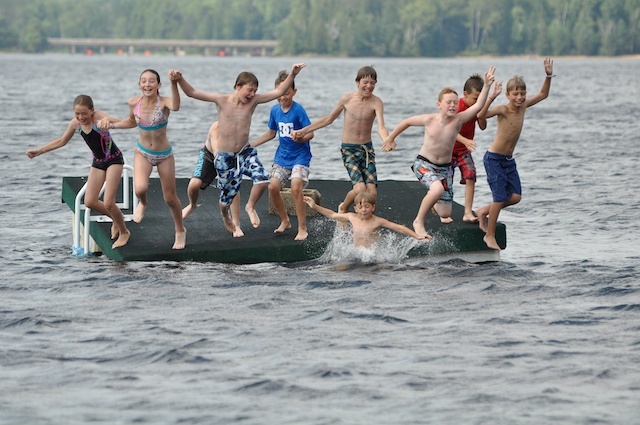 Ask any kid on the lake, there is no place they would rather be….